Everyone knows Pac-Man. Even people who have never played a game in their lives will recognise Pac-Man. That distinctive yellow pie with a slice cut out of it is surely one of the most renowned and important videogame characters ever made. But in that early era of videogames that birthed Pac-Man, he was by no means the only maze-traversing, loot-gobbling hero around. There were so many of these maze games back then, all sharing similar elements; you’d play as a hero of some kind, and the map would be filled with loot to collect, as well as a number of enemies that would make their way around the map to try and catch you. These games were probably relatively easy to program back then, and could be applied to a wide range of different themes - hence their popularity. So I thought I’d take a look back at five Pac-Man-like games from yesteryear that have been almost forgotten, but if you get a chance to play them, do so, because they’re all actually a lot of fun. Based on the incredibly popular gentleman thief character in Japan, Lupin III by Taito is a clunky game to learn, but as it starts to click, the action becomes intense stuff. 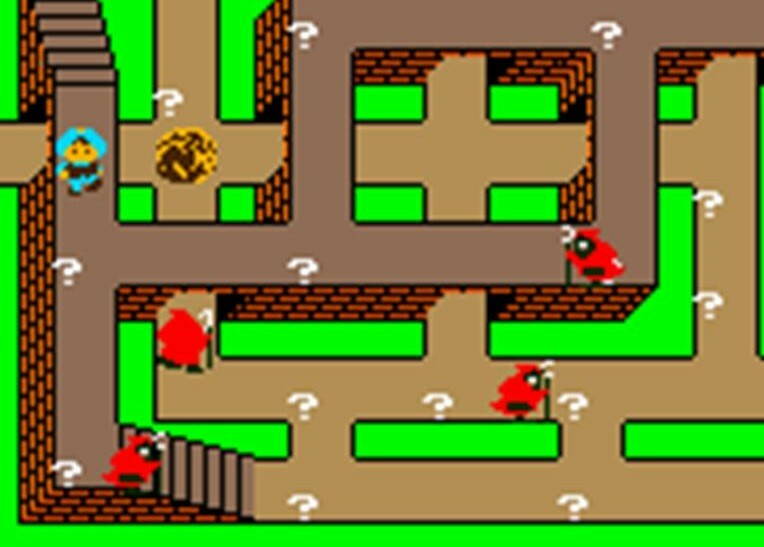 You play as Lupin himself, who is in some kind of building with money bags at one end (one assumes a bank), and a couple of different guards who are trying to stop him from stealing the cash. Your goal is to transfer the six money bags to the bottom of the map, at which point you’ll deliver the money to your girlfriend, who will demand you go get more. And then you’ll repeat that action again. What makes this one enjoyable are two key features. Firstly, there are three different types of enemies, and they all have very different personalities. There’s the guard dogs, which tend to zip back and forth in straight lines, and are rather easy to avoid aside from their speed. Then there’s a security guard, who meanders about and is generally harmless. Then there’s the police officers, that chase you with perfect honing accuracy. By themselves they’re the most dangerous, but the game is at its best when you’re trying to time your way past the “dumb” enemies, while still doing it fast enough to stay out of reach of the police officer. The other neat feature is the ability to “teleport” four times per level. If you’re surrounded or about to get caught, you can use this as a lifeline. Sometimes it’ll even benefit you by putting you closer to the goal. At other times you’ll be teleported into an even worse position. That randomness is an exciting quirk that can help you get a top score, or completely ruin you. Brought to us by Data East, this game doesn’t even pretend to be different from Pac-Man; the basic design of the game is exactly the same. You play a little blob character (“thief”) collecting dots (“coins”), and avoiding enemy blobs (“Police”). Once every coin in a map is gone the exits open and it’s time to make good your escape. At which point you’ll be taken to the next map. There are a couple of variations that help to make this a more strategic game, though. Firstly, the levels are filled with doors that open and close by themselves. Time it well, and you’ll be able to duck through a door just in time that the enemy is left out, and thus escape from them. Play poorly though, and you’ll find the doors closing in front of you and the enemy able to trap you. Related reading: A different version of Lock 'n Chase was actually released on the Game Boy, and is available on the 3DS as a Virtual Console title. Matt's review of that game. The other trick you have up your sleeve is to put up barriers behind you as you wander around. You can have up to two of these in effect at once, and they are another handy way to slip away from a pursuing enemy. If you’re really good, you can even catch an enemy between two doors and trap them, which will give you a nice, healthy points boost. Lock ‘n Chase doesn’t give you the ability to fight back against enemies as you have in Pac-Man; there’s no power pellets that allow you to “attack,” so instead you’ll just have to make good use of your enhanced abilities to evade. So Pac-Man is cool and all, but its levels offer just one maze per level. Route-16 offers 16! What great value for money and all that rot. Basically in Route-16, you play as a very fast car, that needs to explore all 16 different mazes in order to find moneybags, all the while avoiding the other cars, and doing it quickly, as the car has limited fuel. Each maze has entrances and exists, and when you exit a maze, you’re taken to a large map with giant highways to travel on so as to move from one maze to the next. When in that large overworld map you’re able to see where the other cars and treasures are, and if you drive well you’ll be able to explore a map and collect all its treasure before any of the enemy cars even show up. There are issues with this game; for one thing the maps tend to be quite empty, with two or three things to pick up at once, and that makes the experience of actually exploring them less exciting that in something like Pac-Man. And, as much as it makes sense to run through these mazes when you’ve dodged the enemy cars, that can be a lonely experience. Still, the game is a lot of fun, and certainly manages to be challenging enough. Back in the 80s game developers were less tentative about using 1001 Arabian Nights, or the Middle East, as the inspiration for their games. Bigots were less likely to kick up a stink about it. Sindbad Mystery, released in 1983, is actually my favourite Pac-Man-like game of all, because its theme is just so appealing. Layered around each level are pieces of a map to a random section of that map. Your goal is to collect these pieces, and then start digging holes in the bit of map that it depicts. One spot in that map conceals a hidden treasure, and after Sindbad digs that treasure up, he completes the level and moves on to the next one. There’s a really appealing risk vs. reward theme going on in here. Do you try and collect all the pieces of the map and then know exactly where the treasure sits? That’s incredibly difficult to do because the maps are quite small and the enemies very difficult to avoid. Or do you collect just enough pieces of the map to know which section of the maze the treasure is hidden, and then hope to dig it up quickly? Bonus points are given if you’re able to find the treasure fast, after all. There were times where I went for broke after collecting just a few pieces of the map, only to discover (via a game over screen), that I’d misread the map and was digging in a completely different area to where I should be. As simple as the feature is, this game tests the mind as well as the reflexes, making it a more complex and nuanced maze game than most other Pac-Man-likes. Marvin himself is one ugly video game hero. He’s a blob thing with big goggle glasses, and absolutely no personality, but thankfully his game is a lot of fun. In Marvin’s Maze, you need to collect all the dots placed around a two-tier maze, while at the same time avoiding, or defeating, robot enemies. To defeat these enemies, Marvin can pick up power dots, not unlike Pac-Man. Unlike Pac-Man, these power dots don’t allow you to chew down on the enemies, but rather shoot a laser out of Marvin’s eyes, which will instantly defeat any enemy it hits. Because this game’s enemies are quite aggressive, it can be surprisingly difficult to find a change to blast one away, and having to monitor what’s going on on two different sets of mazes at once requires some solid concentration skill. The other neat feature in this game is that mazes have little platforms that move when Marvin walks on one. It’s possible to escape the enemy this way by jumping on the platform and allowing Marvin across the chasm even as the enemy then needs to take the long way around. It’s a good way to get a quick second to breathe before getting back into the action.